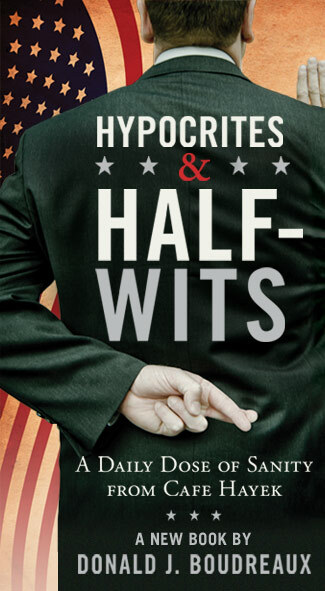 I rarely recommend reading material, but I received a book from my colleague and friend, Don Boudreaux, who compiled many of his letters to the editor in a book titled Hypocrites and Half-Wits. The letters, described as a "daily dose of sanity from Cafe Hayek," blend humor, wit and not-so-common sense in a selection of quick reads. You can find more information here. Highly recommend! Good web site you have here.. It's difficult to find high quality writing like yours these days. I seriously appreciate people like you! Take care!! in his/her brain that how a user can be aware of it. So that's why this piece of writing is great. Thanks!